BA in Information Science and MA in Education Technologies, with over 20 years of experience in K-12, and Graduate levels. Monica has served as an academic leader and curriculum designer with a specialty on e-learning, online training courses development, and educational innovation. Monica was a keynote speaker at BETT Latin America 2017 where her research on Educational safety, well-being, and digital citizenship was well-received. 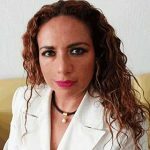 At present, she is director of EDUCA EN TIC, a leading organization in the creation of digital learning platforms. She leads the technology team at Instituto de Ciencias, Guadalajara, where she has been instrumental in the design, development, and implementation of academic and teacher training programs. Monica is lead author, trainer and presenter of «SOY CIUDADANO DIGITAL », an educational cyber safety program which has been implemented since 2013.